Get to know all about Breastfeeding! Whether you think about it or not, your pregnant body is already preparing itself for breastfeeding from the start of your pregnancy. This is for example one of the reasons your breasts grow during pregnancy — your milk ducts and milk-producing cells are developing and more blood goes to your breasts than before. Learn as much as you can about breastfeeding even before your baby’s born. Talk to nursing friends, read books to familiarize yourself and consider taking a breastfeeding class some time during pregnancy and preferably in your last trimester. The more you know about how to get started and the benefits of nursing, the more likely you are to succeed at it. There’s a lot to learn about the basics of breastfeeding: the best breastfeeding positions, creating your own nursing sanctuary at home, and many tips & tricks to help you get started once the baby has landed into your arms. Many women look forward to feeding their newborn baby all by themselves, but not for everyone breastfeeding comes easily or naturally. No worries! During this evening we will go over the basics of breastfeeding, what to expect in the early weeks and what you can do yourself to create the best possible circumstances to make it a succes. We will also discuss popular myths, success stories, and there will be ample time for any (practical) questions you might have on the subject. Madhusmita (known as Madhu) herself went through a tough breastfeeding journey after her first pregnancy 4 years back. As a result, she did intensive research on this topic, joined multiple support online forums and pledged to help other expecting and sometimes struggling mothers by providing them the right information, support and encouragement. Apart from breastfeeding, cloth diapering, sustainable living , baby wearing, post pregnancy fitness and attachment parenting are other topics close to her heart. 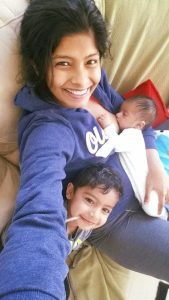 Madhu is mother of 2 little boys living in Utrecht for almost 3 years. In her day job she works as a change project manager helping organizations with IT changes. She loves travelling, spending time with friends over coffee and a good laugh. Location: Händelstraat 83, Oog in Al, Utrecht. Signing up: Signing up is possible through our Class Schedule of directly here. Places are limited to 10 people, so don’t wait too long with signing up!